You know this one. There are two camera-like things near the base of the door on each end, and they pass a beam of light to each other. If something breaks the beam, the door stops closing. While you probably “test” this sensor plenty of times throughout the year, it should remain on your annual checklist. The test is exactly what you would imagine. Hit the button and break the beam. For safety sake, don’t stand directly under the closing door to perform this test. Depending on your opener design, the door should either stop or reverse when you break the beam. Also, this sensor only activates when the door is closing. 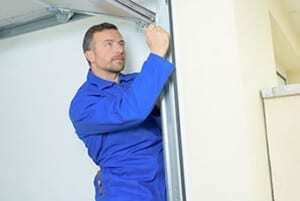 Garage door tracks should be hung in a way that maintains a safe balance. This prevents the door from sliding shut if the gears falter. The test is pretty simple. Switch the door to manual mode and open and close it. The process should have the door gliding smoothly. Furthermore, if you let go in the middle of opening or closing the door, it should hang safely and not slide on its own. If you find that the balance is off, you are usually better off getting an expert to analyze the system. Balance is probably the trickiest part of hanging and maintaining garage doors, and it is easy to incur injuries if you take the DIY approach. The opening system has feedback measurements that cause the door to reverse direction if it encounters too much resistance. The amount of resistance that triggers the effect is adjustable on most openers, and you can check your manual to see if DIY adjustments are easy enough. Regardless, you can test this function pretty easily. First, get a brick or board that is at least an inch thick and put it on the ground where the door should close. Try closing the door, and it should reverse when it can’t push through the board. If this works properly, you can move on to the next test. Stand near (but not directly under) the closing path of the door. When it closes, extend your hands, palms up, and try to stop the door. This will let you gauge the sensitivity setting. Finally, you can safely test the reversal while the door is opening. Simply lean against the door while it is closed and hit the button. Your weight should be enough to trigger a reversal. If these settings aren’t satisfactory, you can follow the instructions in your manual or call a garage door professional to adjust them properly. That’s it! These tests, performed once a year, are enough to prevent garage door related incidents.